Sonoma Clean Power has recently launched a new, $2.5 million venture to help people buy electric vehicles and install at-home charging stations. The measure will target the largest source of pollution in Sonoma County, tailpipe emissions. 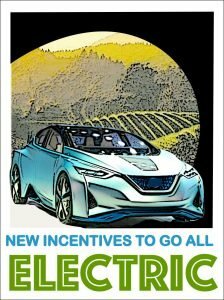 Starting October 27 and through January 5, Sonoma Clean Power will offer its customers $2,500 discounts — on a first-come, first-served basis — to buy or lease a Nissan Leaf or a BMW i3, two models of electric vehicles on the market. Nissan and BMW have offered additional on-the-spot rebates against the purchase price of the vehicles at Santa Rosa-based Jim Bone Nissan and Hansel BMW. Nissan is offering a $10,000 immediate rebate on Leaf purchases and up to $11,625 for the lease option. BMW is offering $10,500 off for purchases and $9,500 off for leasing. Low-income Sonoma Clean Power customers are eligible for a $5,000 discount. Additional state rebates and federal tax credits are also available for the purchase of electric vehicles. Sonoma Clean Power says the program will provide 400 Sonoma Clean Power customers with the $2,500 discount and 80 low-income customers with the $5,000 discount, not including the dealership incentives. An additional $1 million is available for installation of home-chargers ($1,000 discount for 1,000 at-home chargers). Register to get a certificate proving you are a Sonoma Clean Power customer and eligible for the SCP incentive. It can take up to 5 business days to receive your certificate, so be sure to sign up a week BEFORE you visit the dealer. Holding a certificate does not guarantee that funds will be available at your time of purchase or lease. Drive Electric Day at Coddingtown: Charged with Excitement!